In the beginning of the AM craze, everyone thought that the future of manufacturing was right around the corner. Once the storm had subsided and everyone was back to reality, most of the projects that had sparked at that moment were gone, but some endured. What was the difference between those which never made it past the news and those that are now solid industrial realities? For Nike, it was a matter of testing the market’s appetite and iterate on a product (and a production line) that worked. Its new line of 3D printed shoes is the heir of a project that’s year in the making and is eyeing mass production only after making sure that the path was true. Others saw in AM an opportunity to disrupt the established manufacturing infrastructure, and gradually implemented a new system, tried and tested to now enable to approach things differently. GE is one such case, one of the first to adopt AM and now it boasts one of the most extensive portfolios of applications in the field. However, sometimes a project needs the right fertile ground of established research to start growing. As NASA and Lockheed Martin constantly bring new aerospace parts to the testing grounds, proving the liability of AM in such a high-stake industry, new companies like Relativity Space hope to push the endeavor even further, by printing entire rockets. We are very grateful to those entrepreneurs who had the courage to jump into uncertainty, some to success some to failure, and make the world of AM what it is today. Nike’s 3D printed shoe Zoom VaporFly Elite Flyprint 3D will soon get a wider release. The Flyprint 3D is the updated version of the famous 3D printed Nike Zoom Vaporfly 4%, designed with the help of Eliud Kipchoge, winner Berlin marathon 2018. The Beaverton-based footwear giant has worked to perfect the Vaporfly 4% since last year. For this purpose, the company once again recruited the help of Kipchoge. The Zoom Vaporfly is called “4%” because an independent research found that Vaporfly wearing runners can gain 4% of the lead time on their competitors. According to reports in UK rail industry authority the Railway Gazette GE is looking to apply additive manufacturing to components for its locomotives. If all goes according to plan, this could mean that in the next seven years GE Transportation will have an inventory of up to 250 3D printed train components. A pilot initiative for 3D printing at GE Transport is underway as part of its Brilliant Factory model, combined with analytics and lean manufacturing in a Digital Thread. Even NASA has been dipping their proverbial toe in the additive manufacturing waters, testing printed parts for the Space Launch System’s RS-25 engine. It would be safe to say that from this point forward, most of our exploits off of the planet’s surface will involve additive manufacturing in some capacity. But one of the latest players to enter the commercial spaceflight industry, Relativity Space, thinks we can take the concept even farther. Not content to just 3D print rocket components, founders Tim Ellis and Jordan Noone believe the entire rocket can be printed. Minus electrical components and a few parts which operate in extremely high stress environments such as inside the pump turbines, Relativity Space claims up to 95% of their rocket could eventually be produced with additive manufacturing. We’ll be at Formnext in Frankfurt from the 13th to 16th November. Come see us at booth #B30J. The space industry finds itself in the sweet spot of many advanced technologies, hoping to improve mission success by looking at its problems from all sides. 3D printing has already proved to be a powerful tool for these purposes, with its fast iterative cycles and outside-the-box manufacturing paradigm. What Airbus has been doing for its airplanes, Lockheed Martin is pushing beyond with 3D printed parts that can reach sizes just under 4ft, halving production time, costs and reducing weight. Still, it will be extremely expensive to launch humans to Mars or even the Moon in the near future. For that, we’ll have to rely on robots (with much lower maintenance requirements). By sending autonomous robots to another planet, they can be tasked to 3D print sustainable habitats for us in-situ, by sourcing local materials. Empowered by the digital thread, the designs for these habs can be experimented upon and reiterated, and contests are being created periodically to further improve those that, in a not too distant tomorrow, we could call homes. Lockheed Martin has just taken 3D printing to new heights, printing an enormous titanium dome meant for satellite fuel tanks. It’s the largest space part the company has 3D printed to date and measures 46inch in diameter — just under 4ft. Read the full article on Digital Trends. Rovers may soon traverse the surface of the Moon yet again. This time, though, they’ll have one noble mission: to build shelter the first human colonizers will inhabit. A team of Japanese scientists is working to make this a reality. They started a company called ispace with the intention of launching a private space mission to the Moon. ispace envisions an entire colony, called “Moon Valley”, constructed not by human astronauts, but by robots instead. And they want to get started on it soon: the team is planning its first mission for late 2019, and a second in 2020. Read the full article on Futurism. 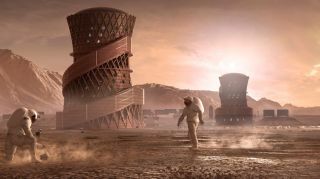 NASA has selected the five winning designs in the latest stage of its 3D-printed Habitat competition, which include a community of modular pods made from the Martian surface, and a vertical egg-like container. 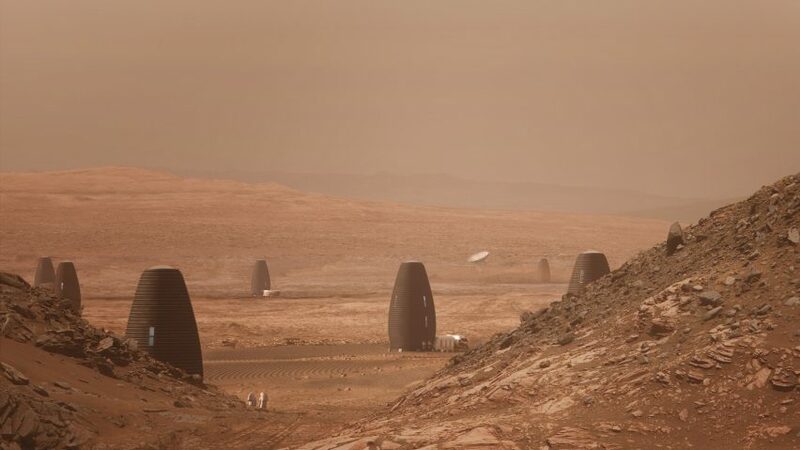 The On-Site Habitat Competition invited groups to design a sustainable shelter for a crew of four astronauts on a mission to Mars, using construction techniques enabled by 3D printing technology. Welcome to our 30th News In Review for 2017! We’ve all heard of the 3D printed heart and ear tissue. There is much more to bioprinting than these initial steps and, thanks to new technologies, explorations and endeavors, the road ahead is looking a whole lot more exciting. 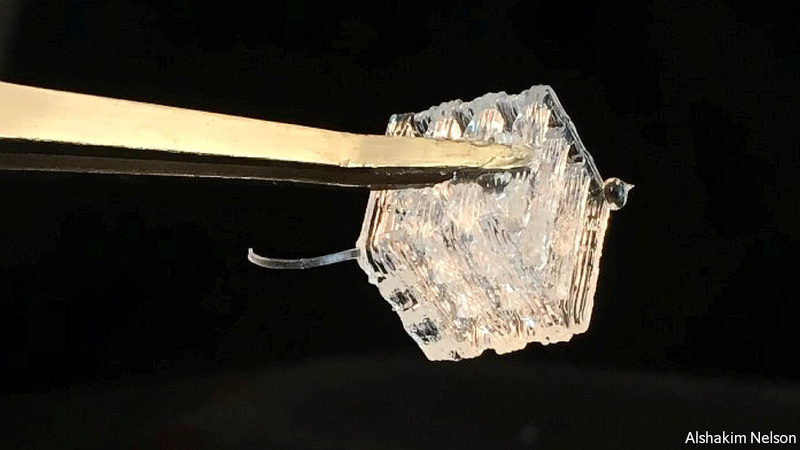 New technologies enable researchers with nanoscale control of the manufacturing environment, both low-powered and more precise, to create bioprinted scaffolds for a variety of uses. Synthetic biologist will surely make good use of the new tech: 3D printed bioreactors can be manufactured to generate specific kinds of biologic products, like proteins of even antibiotics. Bioprinting is skyrocketing, beyond the confines of our atmosphere. NASA has revealed plans to bring bioprinted cancer cells to the ISS in order to study potential treatments in a controlled, zero-g environment. […] the use of high-powered lasers to pattern micro/nanoscale objects has drawbacks. In particular, the substantial energy required to move material or objects means that high throughput of material is not possible. Now a team at the National University of Singapore have announced another technique to engineer living tissue. In the paper “Effective Light Directed Assembly of Building Blocks with Microscale Control” a method for improving control over the micro structure with light-directed assembly is described. The researchers believe their method could have applications for bioprinting, tissue engineering, and advanced manufacturing. Working with microfluidic-fabricated monodispersed biocompatible microparticles the scientists were able to fabricate a structure. Carefully selected molds churn out antibiotics. Specially engineered bacteria, living in high-tech bioreactors, pump out proteinaceous drugs such as insulin. Some brave souls even talk of taking on the petroleum industry by designing yeast or algae that will synthesize alternatives to aviation fuel and the like. Dr Nelson’s bioreactors are composed of a substance called a hydrogel, which is about 70% water. The remaining 30% is a special polymer, infused with yeast. [It can] be extruded smoothly through the nozzle of a 3D printer.The fun starts when such a [hydrogel] cube is plopped into a solution of glucose. The hydrogel is permeable to this solution, so the yeast is able to get to work on the glucose, converting it into ethanol as if it were the sugar in the wort of a brewery. […] The surprise was that it keeps on doing so, day after day, week after week, as long as the fermented solution is regularly replaced with fresh. The team’s bioreactors have continued to produce ethanol in this way for over four months now, with no signs of slowing down. Read the full article on The Economist’s website. NASA has revealed plans to grow bioprinted cancer cells in space in a bid to advance cancer research. Utilizing the microgravity environment, NASA hopes to the cell structures will grow in a more natural spherical shape. Since, back on earth in vitro the cells have only able been able to grow in two-dimensional layers. However to harness the cells without the presence of gravity, NASA is hoping to employ magnets. 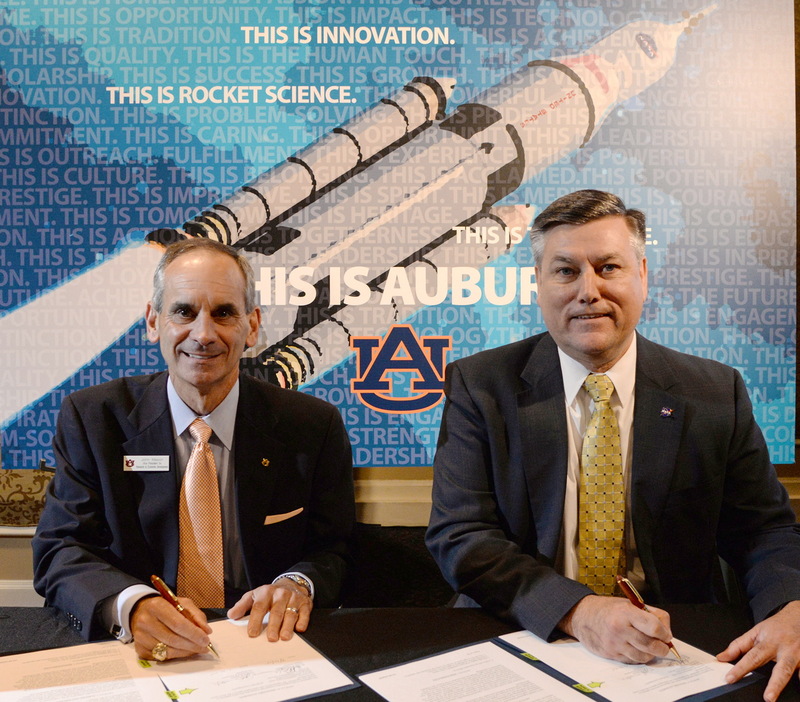 Read more about NASA’s plans here. This is it for this week, don’t forget to check out our Twitter, Facebook and Linkedin feeds for more news on the AM/IIoT world as well as updates to our services. We are all starting to realize that AM is becoming the game changer it promised to be. This week there are mind-blowing examples of the technology being used to radically change the game economically and logistically all across the board. What do you think will be the impact on the manufacturing industry now that players realize that AM can bring shave costs in the millions of dollars like Boeing had on its Dreamliner production in collaboration with Norsk Titanium? Or when serialized production turnaround happens in days instead of months like Oracle managed to achieve with Carbon technology? On a wider note, AM will radically transform planning for operations where in-situ manufacturing is possible, making it much more economically viable to make use of local resources, especially in space activities. A 3D printed structural titanium component made with Norsk’s proprietary Rapid Plasma Deposition (RPD) process. Boeing hired Norsk Titanium to print the first structural titanium parts for its 787 Dreamliner, a shift that the Norwegian 3D printing company said would eventually shave $2M to $3M off the cost of each plane. Strong, lightweight titanium alloy is 7 times more costly than aluminum, and accounts for about $17 million of the cost of a $265 million Dreamliner, industry sources say. Boeing has been trying to reduce titanium costs on the 787, which requires more of the metal than other models because of its carbon-fiber fuselage and wings. “This means $2M to $3M in savings for each Dreamliner, at least,” starting in 2018 when many more parts are being printed, Chip Yates, Norsk Titanium’s vice president of marketing, said in a telephone interview. 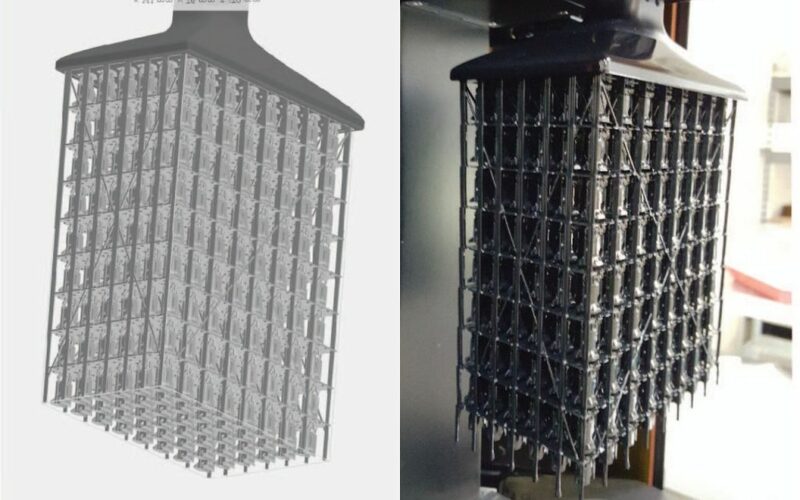 Oracle Labs, the R&D branch of multinational computer technology corporation Oracle, has used Carbon CLIP technology to 3D print a series of end-use brackets for use in its micro servers. 10,000 of the parts were needed to align circuit boards in the systems, and production was turned around within days instead of months. At first, Oracle planned on a component design reliant upon injection molding to hold the circuit boards. This method proved to be ineffective at producing such small parts within the required time frame, and the method didn’t support multiple design iterations. “Instead of printing parts by inch CLIP let us print parts by hour. That’s game changing” – Craig Stephen, Senior Vice President Research & Development at Oracle Labs. Read the full article at 3DPI. “Everything has a finite amount of resources. Everything has a cost and benefit”. With limited resources, how can we populate multiple planets with only one livable environment? Fortunate for us, all of our resources originated in space. Planetary Resources made a point at the CES 2016 that mining asteroids was the future. It did this by using 3D printing and metal from a meteorite to produce a part. In addition, 3D printing may be the process of how things are built in space. Scientists have already 3D printed plastic objects in space, and they believe we can 3D-print metals. However, it might be simpler than this. If water freezes on the surface of the planets we are looking to build on, and there is hydrogen and water as a resource on these bodies, 3D printing ice in the shape of buildings might provide a robust housing. Sound nuts? NASA didn’t think so and awarded $25,000 to a team that designed a Mars Ice House for NASA’s 3D printed habitat challenge. Read more about our space-faring possibilities at Machine Design. Come back next week for another edition of News-In-Review and touch base at our Twitter feed where we share more AM and IIoT related news! Hi everyone, welcome back to the new year with a more weekly 3D printing news from Authentise! Through AM scientists are able to go where traditional manufacturing simply couldn’t take them. NASA is keeping up the pace for the entirely 3D printed rocket by testing more and more components up for the challenge, ROSCOSMOS is planning to add a bioprinter to the ISS’s arsenal and test it at microgravity and, while we’re at it, stem cell research is getting a boost from 3D printing’s ability to create cartilage’s structures. Are you aching for your daily fix of science with a side of AM? Let’s dig in. Recent tests of a developmental rocket engine at NASA‘s Marshall Space Flight Center in Huntsville, Alabama, produced all the performance data engineers were hoping for, along with the traditional fire and roar. But this engine is anything but traditional. Marshall engineers are designing each of the components from scratch to ultimately be made entirely by AM methods …The series of 12 test firings in late fall brought them a big step closer to that goal, said Andrew Hanks, test lead for the project. The fuel turbopump, fuel injector, valves and other major engine components used in the tests were 3D printed, with the exception of the main combustion chamber. Read more of these test firings at NASA. Russian scientists are planning to install and operate a 3D bioprinter aboard the ISS, according to an official source. They believe that microgravity conditions could actually improve the bioprinting process. 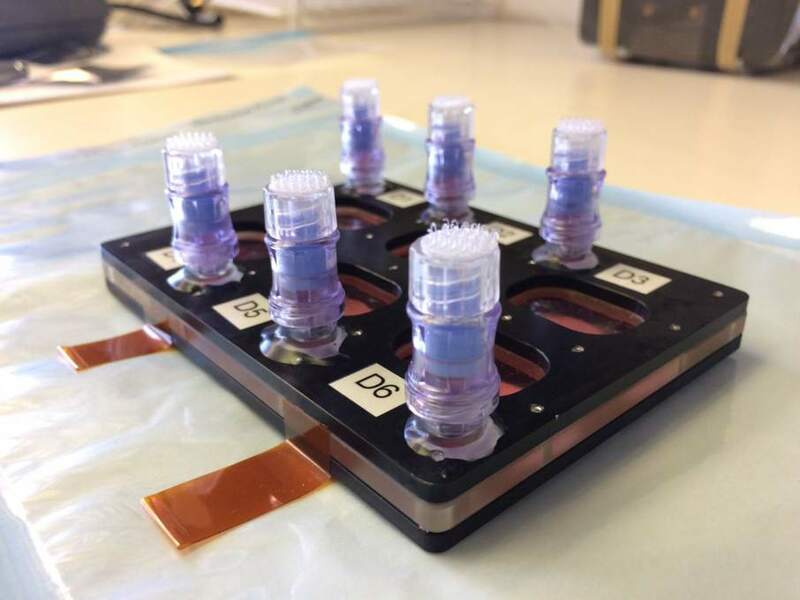 […] They believe that significant progress in bioprinting can be achieved by placing equipment in microgravity conditions, since the lack of gravity could potentially help to keep deposited cells in place. Inspired by the earmouse, doctors at the University of California at Los Angeles and the University of Edinburgh’s Centre for Regenerative Medicine have perfected a new technique to grow a fully formed human ear, using patients’ own stem cells. They begin with a 3D printed polymer mold of an ear, which is then implanted with stem cells drawn from fat. As these stem cells differentiate into cartilage, the polymer scaffold degrades, leaving a full “ear” made of mature cartilage cells. The new approach could “change all aspects of surgical care,” says Dr. Ken Stewart, one of the researchers and a plastic surgeon at the Royal Hospital for Sick Children. Read the whole article at Smithsonian. Hi and welcome to another Week-in-Review! This week there is a treasure trove of evidence that partnerships and collaborations really do make a difference and show a rapidly maturing industry. This week’s examples go full spectrum: Renishaw and Dassault bang brains together trying to solve AM design and optimization issues, a collaboration between Auburn U and Nasa seeks to push the limits of space exploration even further through AM creating and another collaboration has designed and printed the best golf driver in the world. Want to hear more? Here you go. Renishaw is collaborating with Dassault Systèmes, a world leading 3D modelling, simulation and industrial operations software provider, as part of its commitment to provide and enhance software for metal additive manufacturing (AM). “The 3DExperience platform coupled with QuantAM enables parts to be produced accurately from the outset, which is of tangible time and cost benefit to users. It marks the beginning of many enhancements we have in the pipeline to improve the AM user experience and streamline the front-end of the manufacturing process” explained Stephen Anderson, Renishaw’s Director of Group Software. Race car manufacturer, CRP Group and golfing manufacturer, Krone Golf have combined additive manufacturing and subtractive manufacturing techniques to craft what they believe is the world’s most advanced golf driver. The KD-1 is the first Windform SP 3D-printed driver clubhead with CNC machined titanium hitting surface. It is a composite driver clubhead where the different materials have a specific function and structural competence. Read more about the driver here. As always, feel free to sign-up to our newsletter to keep updated with our latest news and updates!